Johnson&Johnson ACUVUE® OASYS® for Astigmatism Contact Lenses (6 Pack) - A fortnightly disposable contact lens that corrects astigmatism, delivering exceptional vision, outstanding comfort and health. Acuvue Oasys contact lenses provide excellent comfort, even in dry, challenging environments like computer work, air-conditioned offices, and daily commuting. 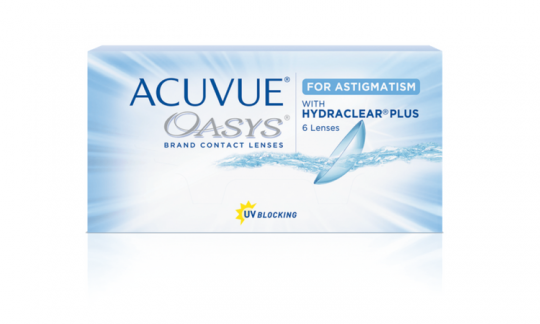 Acuvue Oasys for Astigmatism contact lenses developed specifically for astigmatism, combines the proven comfort of ACUVUE® OASYS® Brand Contact Lenses and the breakthrough technology known as Accelerated Stabilisation Design. These lenses remain positioned regardless of your activity giving crisp, stable vision. With unique HYDRACLEAR® Plus technology, these lenses are ultra-smooth and enhanced with extra wetting agents, keeping your eyes so comfortable that you will forget you are wearing them. Acuvue Oasys contact lenses also have high UV protection blocking out at least >96% of the UV-A radiation and >99% of the UV-B radiation from the sun.